Fractional distillation is a technique used to separate close boiling materials and to produce high purity distillates. In simple distillation, all the material that is vaporized is collected in the receiver. In fractional distillation, not all of the vaporized material is collected. Some vaporized material is allowed to flow back down the fractional distillation column (reflux) so that it can be distilled again and again. This repeated distillation due to refluxing further separates the close boiling materials and produces higher purities then by simple distillation. Purification is further aided by the fractional distillation column. Inside the distillation column, packing or a spinning band is used to maximize the contact between the ascending vapor and the descending reflux. More vapor liquid contact equates to a better fractionation. A vapor-liquid diagram of an ideal binary mixture is helpful in visualizing the fractional distillation process. 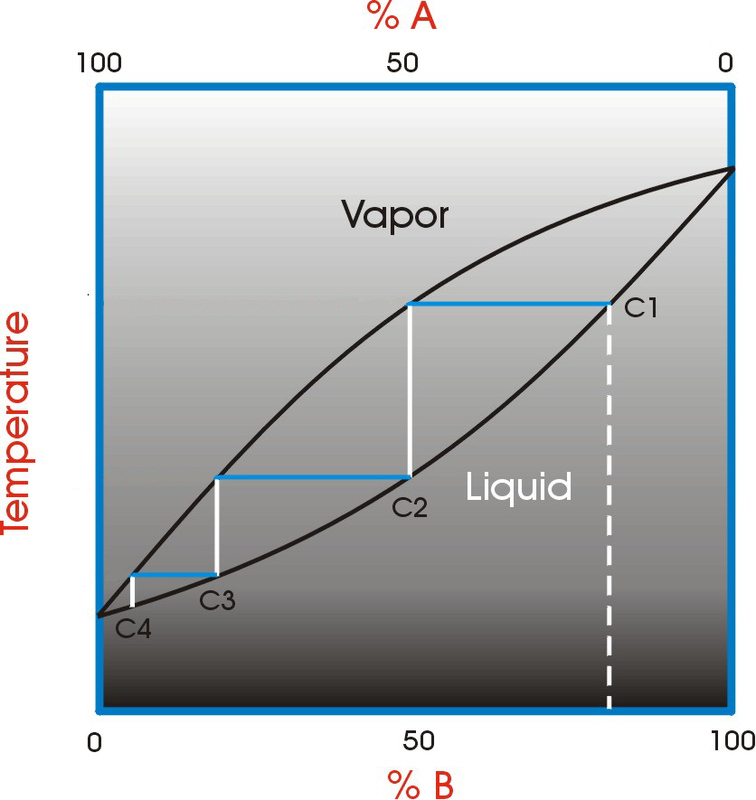 The bottom curve is the liquid mixture and the top curve is the vapor mixture. In this example, a starting liquid mixture at C1 is used. The first vaporization follows the blue line to the left with a corresponding increase in purity. This vapor is then condensed and returned to the boiler (follow the white line down to the liquid curve at C2). This is a single step in the fractionating process. The blue and white lines combined even look like a step. Each step moves the purity to a higher level. The better the fractional distillation column and the higher the amount of reflux gives more “steps” and therefore a higher purity. Fractional distillation is used for the distillation of crude oil in the petroleum industry. The fractional distillation of the crude oil is the starting point for the manufacturing of gasoline, lubricating oil, diesel, fuel oil, chemicals and plastics. B/R makes models for the fractional distillation of crude oil on the laboratory scale according to ASTM D2892 and D5236. The models provide a lab scale simulation of the fractional distillation process in the refinery. A similar application is the application of fractional distillation to bio-diesel. Bio-diesel production yields undesirable by-products such as methanol and glycerin. Fractional distillation is used to remove these so that the bio-diesel is suitable for use. The essential oil, flavor and fragrance industry also use fractional distillation. Raw essential oils are extracted from various plants such as mint, clove, tee tree and patchouli for example. The raw oil contains impurities that have a bad flavor or odor. 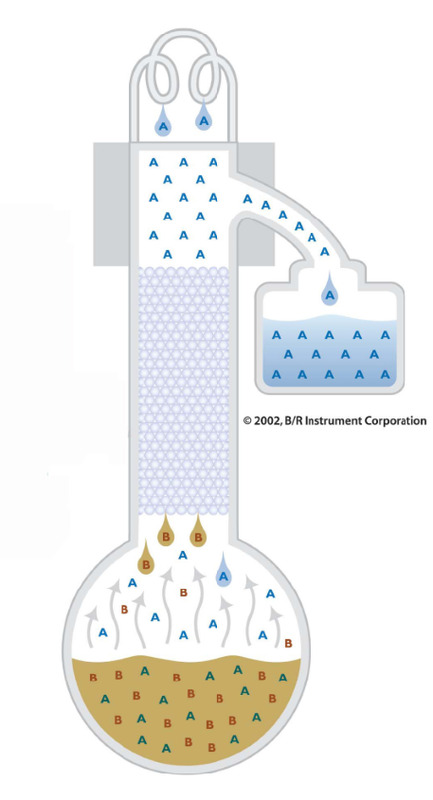 Fractional distillation is used to remove or reduce these impurities. B/R makes a wide variety of fractional distillation systems to purify essential oils. Equipment capacity ranges from 5 ml up to 1000 liters. Solvent recycling and solvent purification is another key area where fractional distillation technology is applied. Industry and laboratories use large amount of solvents. Used solvents contain contaminants that can be removed by fractional distillation. The recycled solvents have purities suitable for re-use.